TCWG Writer of the Year 2012! Went to lunch with the Daily Telegraph Creative Writers’ Group yesterday, it was great meeting people who I had got to know through their fiction and share a love of writing. 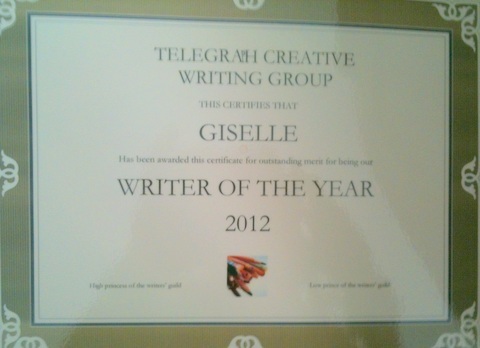 I was thrilled to be nominated ‘Writer of the Year 2012’ for having the most top 3 stories during the year. It really meant a lot to me. Congratulations Giselle, sorry I missed the presentation.